It seems we are born with the belief that we are indestructible. Even as breakthroughs in research, and health care and data collection tell us that certain diseases are hereditary, or eating this will…, or smoking that can…, we still have the ability to tell ourselves – not me – I am immune. There’s always tomorrow. Jerry McArthur, of Urbana, experienced this phenomenon. Even with a family history of heart problems that he knew could be an issue for him, Jerry lived without taking precautions, ignoring the possibilities. Jerry’s life changed on Wednesday, May 1, 2002. “I had a heart attack. I knew that heart issues can be hereditary, but, like most people, I never thought it could happen to me,” Jerry said. He required a stent to open the blockage in his heart. For the first few years, he exercised and watched what he ate, but over time he slipped back into his old routine. In April 2017, Jerry had triple bypass surgery. 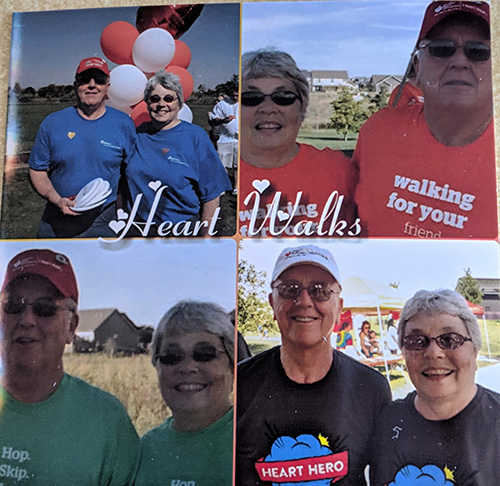 While recovering from his bypass surgery, he suffered a stroke and could no longer ignore his heart and circulatory issues. OSF HealthCare Cardiac Rehabilitation offers personalized programs for people recovering from cardiac events, experiencing breathing problems or just wanting to get healthier. The programs improve physical fitness by helping change participants’ lifestyles. The program worked well for Jerry. But after a year, he had to stop exercising due to an unrelated surgery. While recovering, he had another stroke. The therapists with the Cardiac Rehabilitation program helped Jerry change his habits and lifestyle to support his heart health. We all need a little nudge from time to time, but it’s amazing how some bad habits need a near-death experience before we grasp the impact they have on our health. The belief that we are indestructible and we’ll always have more time can actually play apart in reducing our lifespan or ruining our quality of life. The Cardiac Rehabilitation program requires a doctor’s referral. The OSF Rehabilitation team will work with you and your doctor to determine a plan appropriate for your needs. Talk to your cardiologist or primary care physician to determine if this program is right for you. Visit osfhealthcare.org to find healthy recipes, health risk assessments and our extensive Health Library.